Armor for Sleep was an American rock band from New Jersey, formed in 2001 and disbanded in 2009. The final lineup consisted of lead vocalist, guitarist and songwriter Ben Jorgensen, lead guitarist PJ DeCicco, bassist Anthony DiIonno and drummer Nash Breen. After initial demos had been distributed, New York-based independent label Equal Vision Records signed the band and went on to release the concept-based albums, Dream to Make Believe (2003) and What to Do When You Are Dead (2005). 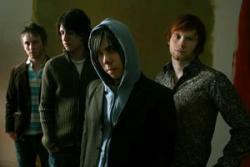 The following year they signed to Sire Records/Warner Bros. and released their last album Smile for Them (2007). They announced their disbandment in October 2009.